Hip dysplasia is defined as a deformity of the hip joint that occurs during the growth period. Hip dysplasia is a hereditary condition that creates a poorly fitting hip joint. The hip joint (known as the coxofemoral joint) is a ball-in-socket joint. The "ball" of the femur (thigh bone) is supposed to fit snuggly into the "socket" of the pelvis. When this fit is poor, the joint is loose and deteriorates over time causing pain and lameness. Hip dysplasia can happen to any breed of dog and even in cats, but some breeds are more commonly affected. These breeds include: German Shepherd, St. Bernard, Labrador Retriever, Rottweiler, Pointers, and Setters. Suspicion of hip dysplasia can be based on history of clinical signs and breed. However, the clinical signs of hip dysplasia may mimic other diseases. Final diagnosis of hip dysplasia can only be made via pelvic xray. To obtain a proper xray view, the pet must be carefully positioned with their rear legs stretched out. For dogs that have painful hips, a sedative or brief period of anesthesia may be required. In the normal hip, you can see that the "ball" of the femur fits smoothly into the "cup" that is the pelvis. In the mild dysplasia view, the fit is abnormal. This "ball" of the femur is flattened and not entirely seated inside the "cup" of the pelvis. In the severe dysplasia view, both the "ball" and "cup" are deformed. This joint is degenerative and very painful. Joint supplements can be very useful in early cases of hip dysplasia or osteoarthritis. Glucosamine / chondroitin supplements such as Dasuquin or Cosequin are used to protect the joint cartilage and slow the progression of arthritis. Omega fatty acids, found in many supplements as well as Hill's Prescription Diet J/d, eases inflammation in the joints. Duralactin is an example of an all natural anti-inflammatory that is milk protein based. Non Steroidal Anti Inflammatory drugs (NSAIDs): there are many drugs in this class that are made specifically for dogs. This type of drug targets the inflammation inside the joint which is what causes the joint to be painful. NSAIDs should always be given with food- do NOT give them if your pet is not eating or drinking well. Tell your veterinarian about any other medication that your pet is taking as drug interactions can occur. Routine bloodwork is generally recommended for chronic use of NSAIDs. Talk to your veterinarian regarding potential side effects. Additional pain relievers: if your dog is still painful, other types of pain relievers may be added on a case-by-case basis. Example medications may include tramadol, adequan, or gabapentin. Laser therapy can also be helpful in relieving pain and inflammation. Weight loss: Keeping a lean body weight is incredibly important to keep excess strain off the joints. Please talk to your veterinarian if you have questions regarding your pet's appropriate weight and diet. Dasuquin / Cosequin are glucosamine chondroitin based supplements for dogs and cats. Click for more information. Duralactin is a milk based natural anti inflammatory that comes as a flavored chewable tablet or a soft chew. Duralactin is available for cats and dogs. Click for more information. Adequan is an injection that combat enzymes that degrade the joint when arthritis is present. First used in racehorses, this product is also available for dogs. Click for more info. 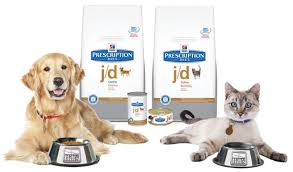 Hills J/d is available for dogs and cats. This prescription diet has an extreme amount of omega fatty acids that help decrease joint inflammation. Click for more information. There are three main types of surgeries that can be performed to ease the pain of hip dysplasia. These surgeries are performed by orthopedic specialists. Femoral Head Ostectomy (FHO): this surgery involves the removal of the "ball" of the femur. This may seem extreme, but as the body heals a "false joint" made out of scar tissue will form. This surgery does relieve pain, but the affected leg will have decreased range of motion. FHO is appropriate for small dogs that do not have to bear as much weight on their hips. Some large dogs may be helped by FHO as well if their arthritis is severe, is the hip is dislocated, or if the expense of other procedures are prohibitive. Triple Osteotomy: this procedure involves the pelvis being cut into three pieces. The bones are then rotated and fixed in place to create better alignment with the "ball" of the femur. The goal is to allow the joint to function in a more normal fashion without looseness or pain. This type of surgery should only be performed in a very young pet with no arthritic changes in the joint. Hip Joint Replacement: this procedure in pets is very similar to humans. A stainless steel ball and socket are attached to the pelvis and femur in place of the abnormal ones. Although the intent is for the implant to be permanent, the new joint may loosen after a period of time. This shows a pet with an Triple Osteotomy. The red lines of the hip model show were the hip is broken. The xray shows how the pelvic pieces are reassembled and screwed into place. This dog has had a hip replacement surgery done. Dysplasia prevention centers around: good breeding, appropriate nutrition, and healthy body weight. If you are picking out a large breed puppy, look for a breeder that has their breeding dogs tested for hip dysplasia (OFA certification). Feed large breed puppies a good quality nutrition that is labeled specifically for large breed puppies. (**Important- many people mistakenly think that feeding an adult food is a sufficient replacement for feeding a large breed puppy diet- IT IS NOT! Large breed puppy diets have a special balance of protein and minerals. Adult diets will not have appropriate nutrition for large breed puppies!). Keep your pet a healthy weight for a longer, healthier life. Talk to your veterinarian if you have questions regarding weight goals and diets.